Another Wells Fargo Toxic Property will soon go on the market. 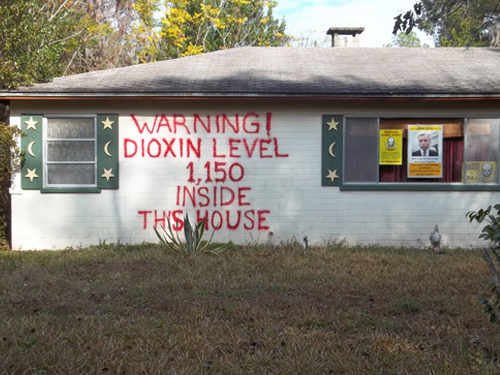 As the warning above clearly states, this house is contaminated with dioxins at levels that exceed US EPA’s safe level standard by more than 1,150 times. Wells Fargo spokeswoman Debora Blume told the Palm Beach Post that Wells Fargo Home Mortgage requires appraisers to identify contamination hazards. 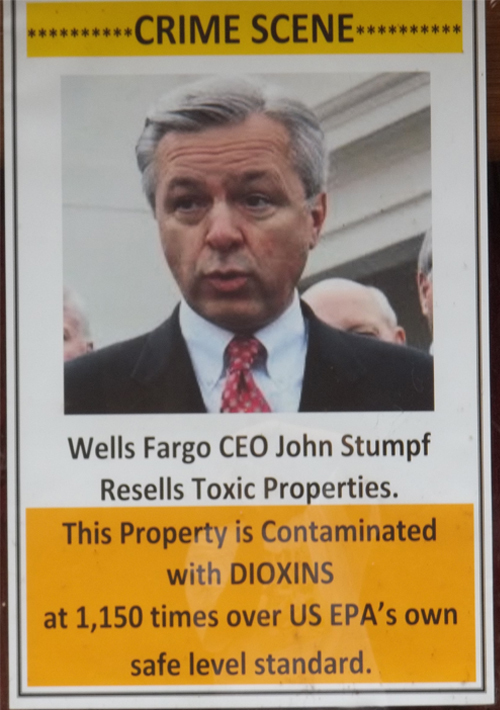 According to Ms. Blume, “Our agencies and investors prohibit the sale of loans when a proven property hazard affects safety and habitability.” In light of this policy, how can Wells Fargo place another unsuspecting low-income family in a house that has proven to be severely contaminated with dioxins, arsenic, PAH’s and other toxic chemicals? There is a major contradiction between this stated policy and what Wells Fargo actually does. When Wells Fargo knowingly forecloses on a highly toxic property in order to place it back on the market, it doesn’t matter whether it does so directly under its own corporate name or indirectly through Fannie Mae, Freddie Mac; etc- Wells Fargo is still culpable for passing contaminated property. Attorneys representing Wells Fargo have been placed on notice about how dangerously contaminated this house is. When Wells Fargo resells this tested highly toxic property without full disclosure, it will simply be continuing its modus operandi of selling toxic properties to unsuspecting low-income and minority families that has earned Wells Fargo heavy fines in other states. It would appear that Wells Fargo has not learned from its mistakes. When the new homeowners discover that this house is so dangerously toxic that it was at the forefront of a major class action lawsuit, and that the foreclosing bank was aware of this, Wells Fargo will likely find itself embroiled in legal actions, and protests are sure to follow.